Mary Greenwell's second fragrance was inspired by her holidays in Italy and her love of these simple but strong fruits. Lemon is sparkling on the top with a luscious herby finish, another truly unique scent from Mary and her wonderful perfumer Francois Robert. The top notes of Lemon, Mandarin, Lime, Bergamot and Bitter Orange are so well blended that no single note dominates this citrusy accord. As the fragrance begins its dry down the heart becomes intoxicating. Delicate florals of Narcissus Absolute, Hyacinth, Jasmine and Muget [sic] are subdued by just the right amount of Clary Sage which gives the fragrance an herbaceous, tea like aroma. What remains is a lovely balance of wood, spice and powdery amber. 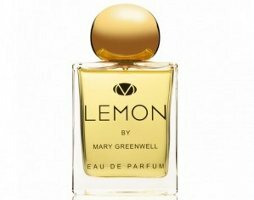 Mary Greenwell Lemon is available in 50 and 100 ml Eau de Parfum, or in a 7.5 ml purse spray. It can be found now at Parfum1. I’d like to smell this one..even though Plum was more of a tuberose scent than anything else. Ooooh! Plum wasn’t my thing, either, but this sounds like a must-try. Hi Robin, and everyone (I’m late as usual). Plum wasn’t my thing either, as I found it far too tuberosy and a bit like Poison. I’ve tried Lemon and found it much more to my taste, but it wasn’t as juicy and zingy as I hoped. It dries down quite quickly to a powdery jasmine. Very pleasant, but just not enough lemon! Bummer to hear there is not enough lemon, much like Plum not having enough plum, I see a theme here.